Sunday, March 13, 8 p.m., Ancient Future: Sitar/Guitar Jugalbandi with Pandit Habib Khan (sitar), Matthew Montfort (scalloped fretboard guitar), and Debopriya Sarkar (tabla), Music Recital Hall in Capistrano Hall, CSU Sacramento, Sacramento, CA. Adm: $15 general, $12 senior citizens, $8 students. Tickets at Sacramento State Ticket Office at (916) 278-4323 or at Tickets.com. Friday, April 15, 7:30 p.m., Ancient Future Arabic Fusion Quartet with Georges Lammam (Arabic violin), Matthew Montfort (scalloped fretboard guitar), Doug McKeehan (keyboards), and Salah Takesh (Arabic percussion), Island Center Hall, 8395 Fletcher Bay Road., Bainbridge Island, WA. $12 adv. $15 door, $10 youth. Tickets: Glass Onion, Winslow Drug, or phone: 206-842-2306. Saturday, April 16, 8 p.m, Ancient Future Arabic Fusion Quartet, Blue Heron Art Center, 19704 Vashon Hwy SW, Vashon Island, WA. Tix: $14 gen. $11 members/seniors/students. Box Office: 206-463-5131 & www.vashonalliedarts.org. Sunday, April 17, 2 & 4 p.m., Ancient Future Arabic Fusion Quartet, 21st Annual Skagit Valley Tulip Festival Street Fair, Downtown Mt. Vernon, WA . Free. Info: Bonnie Anderson 360-336-9277. Monday, April 18, 12 noon, Ancient Future Arabic Fusion Quartet, Skagit Valley College, 2405 East College Way, Mt. Vernon Area, WA. Mt. Noon concert and masterclass. Info: 360-416-7764. Tuesday, April 19, 7:30 p.m. , Ancient Future Arabic Fusion Quartet, The Lincoln Theater, 712 S. First St., Mt. Vernon Area, WA. $15 adv., $17 door. Box Office: 360-336-8955. Wednesday, April 27, Ancient Future Arabic Fusion Quartet, Mobius Studio, 281 Fourth St., Ashland, OR. Tix: $9 advance/student/senior, $11 general admission at door. Info: 541 488.8894. Thursday April 28, 8 p.m. , Ancient Future Arabic Fusion Quartet, Rhythm & Bliss Presents at Far Horizons School, 2490 Hilyard Street, Eugene, OR. $13 adv., $17 door. Tickets available at StarGate Books, 1374 Willamette St., Eugene OR. Info: Sharanam 541-687-0282, lewrisingsun@hotmail.com. See story in Eugene Weekly. Friday, April 29, 7:30 p.m. , Ancient Future Arabic Fusion Quartet, Smith Recital Hall, Western Oregon State College, Monmouth, OR, $8 gen. $5 students/seniors. Box Office: 503-838-8275. Saturday, April 30, 7:30 p.m., Ancient Future Arabic Fusion Quartet with special guest dancers from The Circle Dance Company, Taylor-Meade Performing Arts Center, McCready Hall, Pacific University, 2043 College Way, Forest Grove (Portland Area), OR. $20. Tickets: Pacific Box Office: 503-352-2918 (boxoffice@pacificu.edu) and ticketswest.com. Sunday, May 1, 5 pm. , Ancient Future Arabic Fusion Quartet, Moscow Renaissance Fair, 3rd and Hayes, Moscow, ID. Free. Info 208-882-1800. 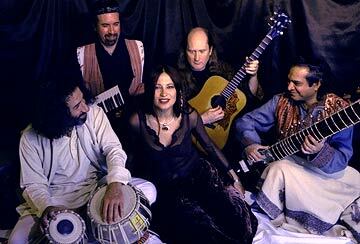 Tuesday, May 3, 7 p.m., Ancient Future Arabic Fusion Quartet, Unity Church, 4465 N. 15th St., Coeur d' Alene, ID. $12 adv., $15 door. Tickets: Barb at (208) 818-1448. Wednesday, May 4, 11:30 a.m., Ancient Future Arabic Fusion Quartet, Jazz Presents, Spokane Falls Community College, Spokane, WA. Free introductory show. Info: 509-533-3724. Wednesday, May 4, 7:30 p.m., Ancient Future Arabic Fusion Quartet, The Met, W. 929 Sprague, Spokane, WA. Adults $18, Children + Seniors $12. Tickets: The Met Box 0ffice: 509.227.7638 and ticketswest.com. Friday, August 12, 8:30 p.m., Ancient Future Spain Guitar Festival Tour featuring Matthew Montfort (scalloped fretboard guitar), Mariah Parker (santur) and Tapan Bhattacharya (tabla), Festival Internacional de Guitarra de Sant Carles de la Ràpita, Sant Carles de la Ràpita, Tarragona Provence, Spain. Sunday, August 21, 2:30-4:00 p.m. Ancient Future Duet, Concerts in the Park, Central Park, Kiely Blvd. near Homestead, Santa Clara, CA. Contact: City Manager's office 408-615-2210. FREE. Saturday, November 5, 10:00-10:45 p.m., Release Party for Putumayo World Music CD Asian Lounge featuring Ancient Future with Bui Huu Nhut (Vietnamese dan bao), Salah Takesh (percussion), and Matthew Montfort (scalloped fretboard guitar) supperclub, 657 Harrison Street , (between 2nd & 3rd St.), San Francisco, CA, , Adm: $10 at the door. For RSVP or more info, contact: eventssf@putumayo.com or call 415.348.0900. Saturday, November 12, 6 p.m., Habib Khan Saraswati Temple & Gurukul Presents Breaking the Boundaries with Pandit Habib Khan (sitar, composition), Matthew Montfort (scalloped fretboard guitar), Mohammad Nejad (ney), Lal Singh Bhatti (dhol), Satish Tare (tabla), Abhinay Padhye (tabla), Peter Block (flute, sax), John Wahler (drum set), and a huge orchestra of advanced students of Pandit Habib Khan, Mexican Heritage Plaza, 1700 Alum Rock Ave., San Jose CA. Tix: $25 & $15. Contact: habibkhan@comcast.net or call 408-528-0786. Saturday, Decembery 10, 4:30 p.m., Ancient Future, lineup TBA, KPFA Crafts and Music Fair, The Concourse, 8th and Brannon, San Francisco, CA. Contact: craftsfair@kpfa.org. Broadcast live at 94.1 FM, or listen on the web at kpfa.org. Sunday, December 11, 2:00 p.m. till?, Ancient Future and world musical bands from Armenia, the Middle East, India, and many more areas, Festival of World Music Dance Party, Ross Valley/Fairfax Masonic Center, 1122 Magnolia Avenue, Larkspur, CA. Suggested donation: $5 or more at the door for a full afternoon of music and dancing! Free CD with a donation of $20 or more. Contact: salaheddin7@yahoo.com or call (415) 454-4352. Lark In The Morning World Music & Dance Celebration August 2005, Mendocino, CA. Matthew Montfort of Ancient Future teaches World Rhythms For All Instruments: increase your rhythm skills by learning rhythms Of Africa, Bali, And India, World Music For Guitar: explore Indian Raga and other world music forms on guitar. Register Online. Camp fills up quickly.